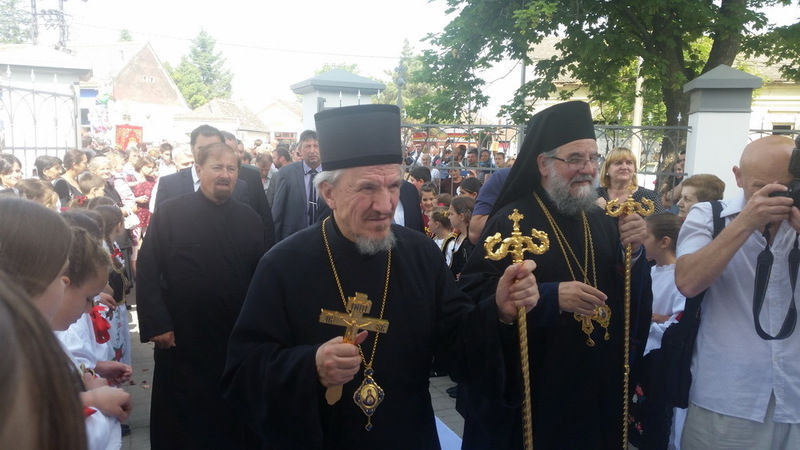 For the citizens of the village of Belegis in Srem yesterday, Ascension Thursday, was a historic day! 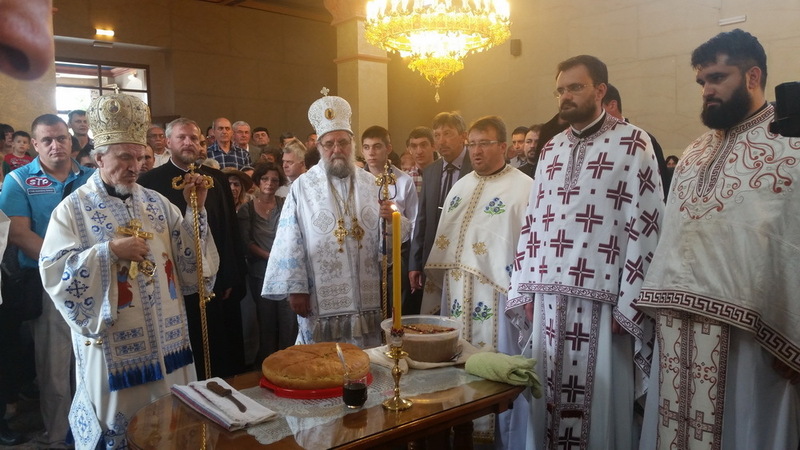 The Church dedicated to the Translation of the Relics of St. Nicholas dawned brightly after months of planning, assisted by the township of Stara Pazova. Young and old, locals and guests, republic, provincial and city representatives as well as the honored Mr. Tomislav Brankovic and his associates from the Committee for cooperation with church and religous institutions of the government of the Serbian Republic, all came to welcome their Graces: Bishop Vasilije of Srem, Bishop Jefrem of Banja Luka and Bishop Mitrophan of Eastern America. A magnificent welcome war prepared – first the Belegis horsemen, followed by fiacres with the hierarchs of our Church bringing blessings to the village of Belegis and children in folklore costume and flowers who with excitement welcomed the hierarchs. Bishop Mitrophan of Eastern America addressed the faithful with a festal homily: In the name of the Father and of the Son and of the Holy Spirit! Your Graces, Very Reverend and Reverend Fathers, dear brothers and sisters. Today is a great day in the calendar of Christ's Church, His Ascension. Everyday, brothers and sisters, we celebrate this day. Whenever we confess our faith as we confessed it today, we said And He ascended into heaven and sits at the right hand of the Father. Today is that special day, the fortieth day after His Resurrection when the Lord ascended into heaven... You heard today in the Holy Gospel how much the Lord blesses us and what blessings He gives us. He always blesses us! How much does He bless us when we curse Him! How much does He bless us when we use His name in obscenities! How much does He bless people who do evil to Him! How much does He bless the unjust! And everything the Lord does, He always does out of His love. 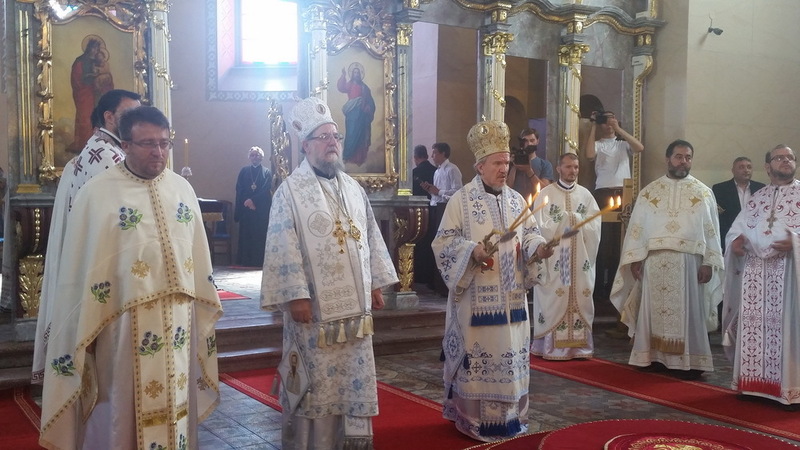 Bishop Vasilije greeted the visiting hierarchs and thanked everyone who took part in this historic day, especially the children and our future generations. In renovating this church – and we know what it was like almost a year ago – we have renovated ourselves, with the hope that we will congregate in large numbers in this holy church. Following the Divine Liturgy and the procession around the church Bishop Mitrophan of Eastern America blessed the Slava Kolach.